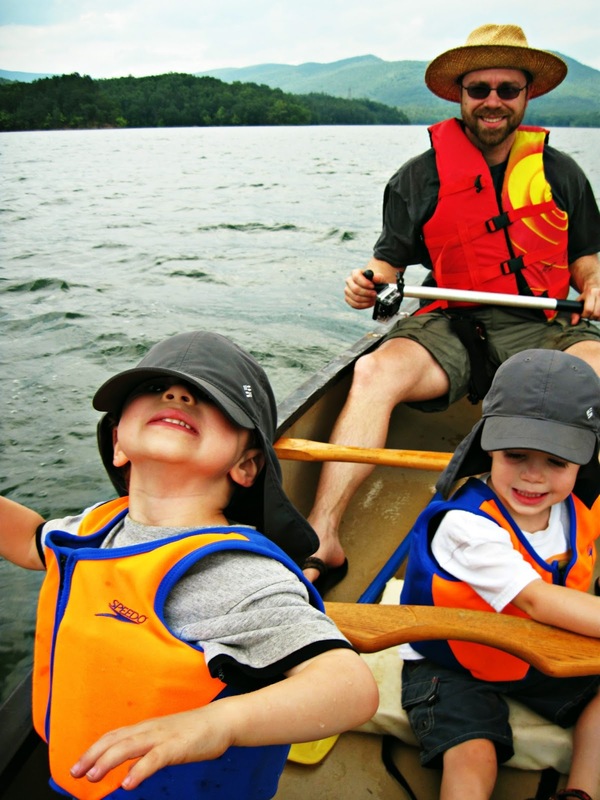 For Father's Day we decided to take the boys canoeing. This is the first time we'd ever been as a family. 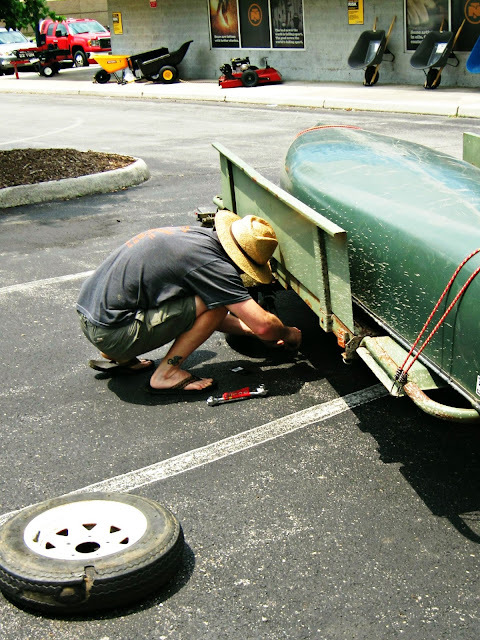 We got off to a slow start when Paul discovered one of the tires on the trailer was stripped. We had to make a detour to buy a new trailer tire along the way. An hour later, we finally launched the canoe. 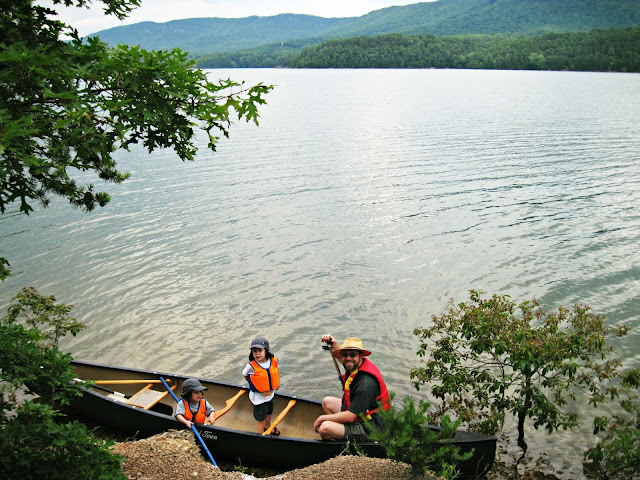 My aunt and uncle gave us this canoe years ago, and we've been so eager to use it - but waiting until we felt certain that the boys would be able to sit quietly on our adventure. Still, I was nervous enough about capsizing that I decided to leave behind my good camera. Instead, I dusted off my old point and shoot for the ride. The boys did really well though. I think the fact that the boat rocked when they shifted weight helped. It provided a little scare factor - just enough to keep them in their seats. 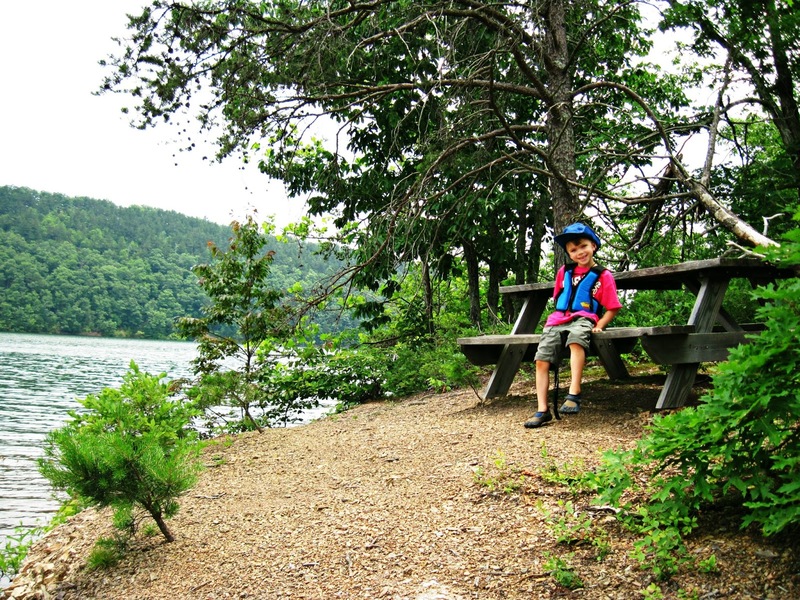 About halfway into our adventure we discovered a marvelous tiny island (we were paddling in a local lake and nature preserve called Carvins Cove). On the tiny island is one of the most perfect picnic spots I've ever seen. Next time we are definitely bringing along lunch! Paddling on the water is so relaxing. 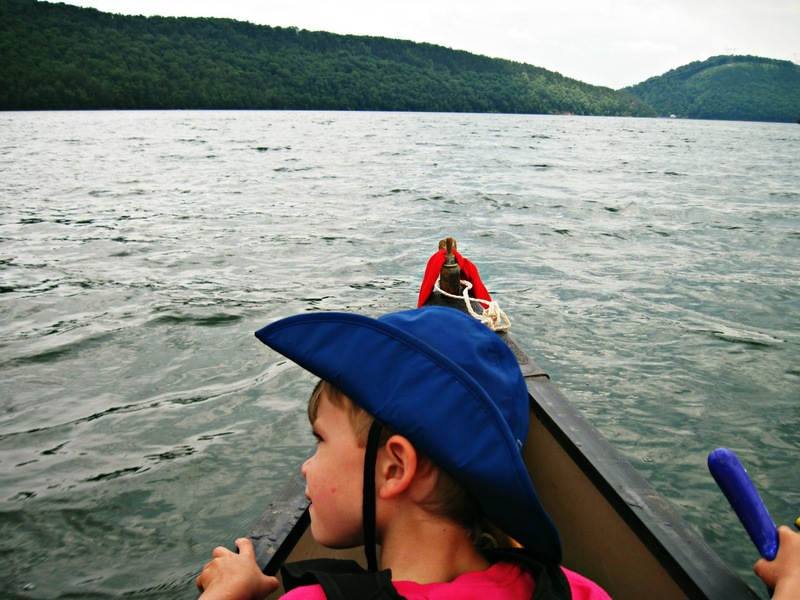 And Carvins Cove doesn't allow noisy boats like jet skis and motorboats, so it really is a serene setting. Lots of smiles, all around. I'd call our first canoe trip a success! Hopefully there will be many more to follow. Helpful Tip of the Day: If your three year old says, "Mom, now can I do exercise in the water?" while you're in the middle of packing up the boat, don't distractedly tell him "Yes". Unless you want a soaking wet 3 year old to bring home. What an awesome adventure. I can see the boys enjoyed the ride. You sure are a brave mom. I would have been terrified to have three active boys in the canoe. You pictures came out great with your point and shoot. Fun time! I've never been there but I think another local blogger has... Tanya, I think you know her What a fun day on the water and an island? How cool is that! Oh what fun! Looks like the kiddos had a great time too! What a beautiful place to paddle! I looks like everyone has a great time. My husband has been wanting to buy a canoe. The girls really enjoy canoeing with their dad. What a fun trip! That's a beautiful and peaceful looking setting. Glad everyone had fun and stayed safe. Your photos turned out really well. So funny about saying "yes." Kids don't care if it's said distractedly! These are just all wonderful pictures, you would never know it is your little camera. My favorite is the boys with you up ahead of them paddling, it's kind of a metaphor for raising children, you do the rowing up front and they sit behind and watch and learn. 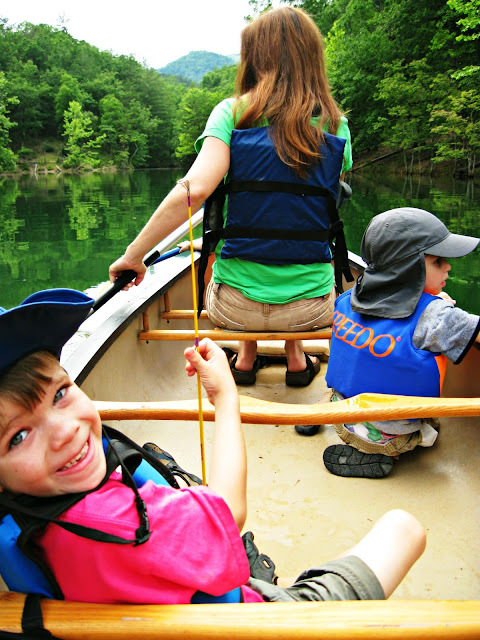 We love going on canoe trips-and we have that same exact canoe that you do! Our first trip, when Amy was about six, was a little scary. The water got really rough half way across a lake and we rowed for shore so hard I thought my arms would fall off:) Canoeing is still my favorite was to have a mini adventure-and it looks like you guys had so much fun!! What a great family adventure! I hope you get to do it many more times. Laughing at the "exercising in the water!" Love those boys! We thought about stopping in Valentine, NE to go canoeing. We were all pretty worn out from our week of cramming stuff in, that we just decided to go see a waterfall. Maybe some other time. What a great day! So fun! And you captured some wonderful images with that point-and-shoot camera! 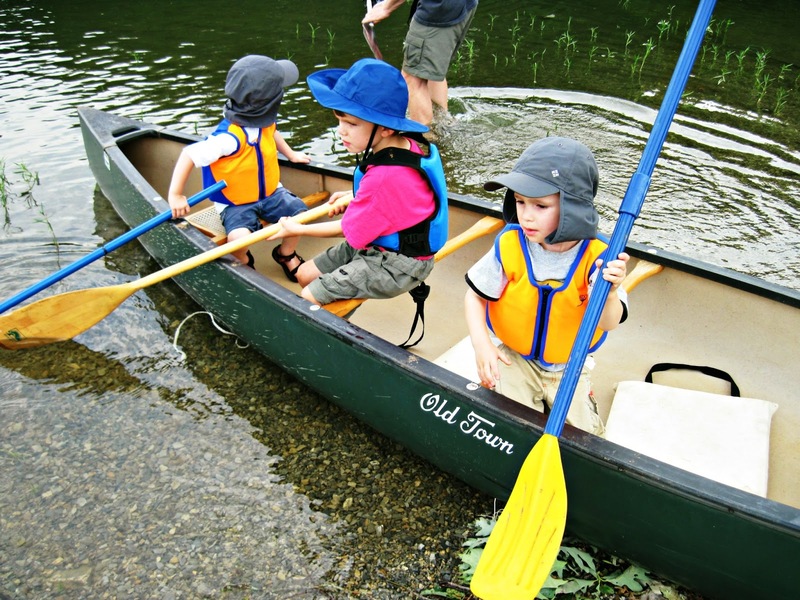 They look so cute in the canoe with their hats on! This looks like so much fun. You must have a good point-and-shoot because these photos turned out really well! How wonderful! LOVE this, Lisa. I'd say they'll be ready to go again soon! Nice! 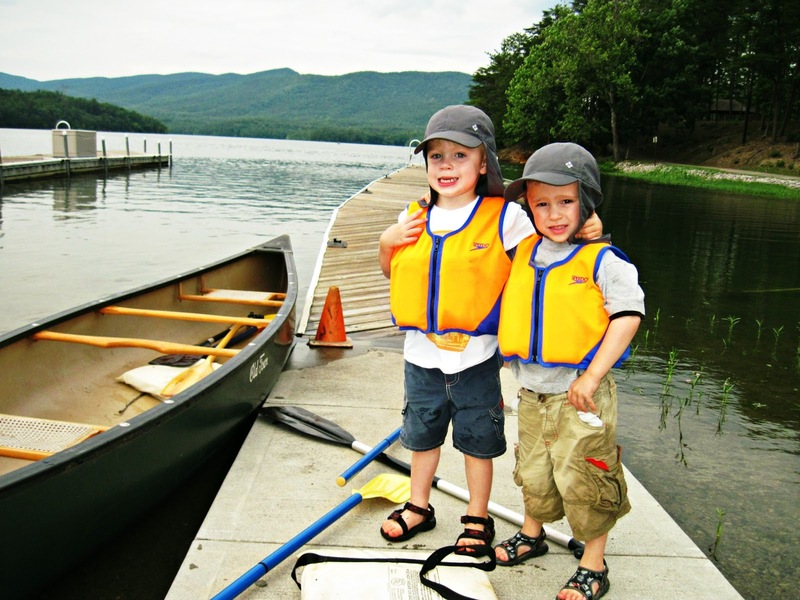 You guys are great parents to take the boys out like this and get them involved in water activities at such a young age. Glad it went well! What a wonderful adventure for you -- I love boating and I'm sad that I waited all these years to go. What a delightful outing! Looks like you all had fun. We left our canoe at the lake with some friends, when we moved into the city about 12 years ago. I would like to get back out there and paddle around a bit. That would be good for me. Wonderful pictures! Your old camera did a great job! The boys look adorable as usual. Looks like a great place to go canoeing. Love the pictures and it looks like it was a lot of fun.